wePresent says it is kicking off one of the company’s biggest years ever with a double debut at Integrated Systems Europe in Amsterdam. After releasing two accessories to complement their line of wireless presentation products last year, the latest hardware will be the first in their line of dedicated collaboration platforms, with market release happening in the second quarter of 2017. The WiCS-2100, which will be shown for the first time at ISE 2017, is the premiere model for wePresent’s Wireless Interactive Collaboration System line of products, and is designed to facilitate collaboration in any environment. As with all wePresent products, the WiCS-2100 supports most major platforms for computers and mobile devices, including enhanced compatibility with Apple AirPlay and integrated Google Chromecast support. 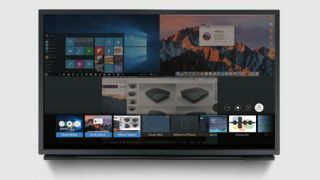 The hardware’s UI is designed for better functionality, allowing previews of connected devices by a moderator before they’re displayed, and an enhanced onboard moderation utility that will be a boon to those in the education sector. Alongside the new hardware at ISE 2017 is wePresent’s Management Suite, a server based utility that allows network-integrated management of wePresent hardware. Once installed, the Management Suite will allow administrators to schedule firmware updates, change the configuration of individual units, or remotely troubleshoot problems with the hardware. Best suited for large networks, such as schools or office buildings, the Management Suite is intended to address the growing need for remote hardware management, easing the workload of IT administrators who oversee an abundance of devices. In addition to debuting the newest in their line of collaboration products, wePresent is giving away one of their award-winning WiPG-2000 wireless presentation units each day of the trade show. Those looking to enter the daily drawing need only visit wePresent in Hall 11, Booth A129 for details. For more information on wireless presentation solutions by wePresent, visit the company’s official website at www.wePresentWiFi.com.